Successfully Added ADEL Fingerprint Door Lock - Store 99 Fingerprints, Pass Code, Key, Auto-Locking to your Shopping Cart. Comes with complete installation kit and has reversible handle for left or right opening doors. ADEL was established in 1991 and has a long history of manufacturing top quality door locks, every one of which goes through 1000 precise processes to ensure maximum security and maintain the highest standards. 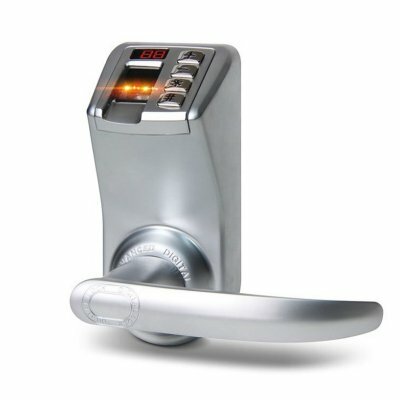 This biometric passcode door lock has been designed for unsurpassed security, style and ease of use. With a reversible handle it’s suitable for left or right facing doors and is designed to fit all standard doors as it’s adjustable for door thicknesses from 1 and 5/32 inches (30mm) to 2 and 3/8 inches (60mm). The ADEL security door lock brings simple keyless security via biometric scanning so a key is no longer needed and its auto locking feature ensuring you will never forget to lock the door behind you. This convenient door lock solution can be programmed with up to 99 different finger prints and allows for fast easy enrty with just one touch. There is an optical sensor that provides the lock with an auto wakeup feature so you only need to place your finger on the biometric scanner for it to automatically scan you finger. As a backup the ADEL security lock allows PIN Code or Key Entry options for triple security. If the batteries are depleted the lock won’t forget any of the fingerprints and you can provide interim power to the lock by simply pushing a 9V battery against the two terminals under the lock, this will then allow you to unlock the door with a valid fingerprint or pass code. Ideal for a range of commercial or residential properties and for areas that require shared and restricted access such as security room, storage rooms, community halls, hotels to name but a few..